IT’S ALWAYS REFRESHING to see an interesting, useful product develop from a good idea. 3D Fax, from InfoImaging Technologies Inc., is one such product. Because of its misleading name, I almost passed this software, thinking it yet another fax utility. A closer look revealed a unique product. 3D Fax allows anyone to transfer one or more binary files via a fax machine or fax/modem using a standard fax protocol. Yes, binary files via a fax protocol! Now, relax and let me explain how it works. 3D Fax compresses and then transforms binary files into a coded bit-mapped image called InfoImage. The image is a black-and-white box or boxes filled with densely populated dot patterns. Then, using a fax machine or a fax/modem, you send the InfoImage to another fax machine or fax/modem. In the case of a fax machine, you’ll need to print the InfoImage and take it to the fax machine for transmission. 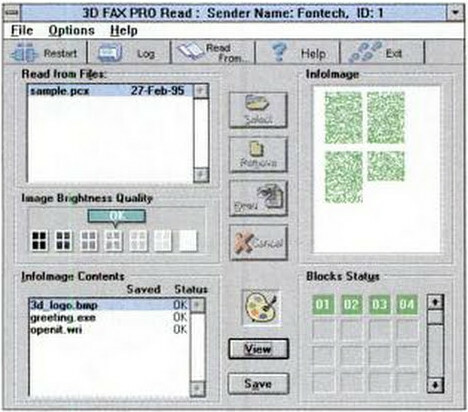 With a fax/modem (and installed fax program), 3D Fax will send the job to the fax driver for transmission. One major drawback is that you need the 3D Fax application on the receiving end to convert the coded image back into its original binary form. InfoImaging helps solve this problem by distributing a free edition of the 3D Fax software that has a limited set of features but does allow for encoding and decoding of files. I installed 3D Fax on two machines with different brands of V32-bis (14.4Kbps) fax/modems and fax software. Using a Telecom Analysis Systems line and PBX simulator, I created an analog line free of any noise. I then proceeded to fax a 20 page Word document to the second machine. Uncompressed, the .DOC file was 90KB and took almost 15 minutes to transmit via standard fax protocols. Compressing the file with 3D Fax reduced its size to 36KB and one page, and took 3 minutes, 30 seconds to transmit. 3D Fax transmits binary files and bit maps as a series of dots. This can speed file transfer and effectively encodes your message. I performed the same test with a 302KB graphics file. Using the standard fax protocol, the fax transmitted in 3 minutes, 15 seconds. Compressed with 3D Fax, the file was reduced to 31KB, though it about the same amount of time to transmit. So where is the advantage? After decoding the InfoImage on the receiving workstation, I ended up with a binary file, not just a bit-mapped image. The color picture quality remained intact and my .DOC file was ready for more edits. 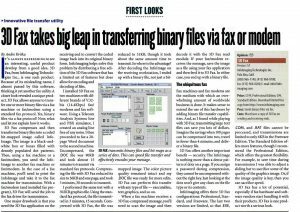 3D Fax can perform this transfer with any type of files – executables, text, graphics, and so on. When a fax machine receives a 3D Fax-compressed message, you’ll need to scan the image and then decode it with the 3D Fax read module. If your fax/modem receives the message, save the image as a file using your fax application and then feed it to 3D Fax. In either case, you end up with a binary file. Fax machines and fax modems are the medium with which an overwhelming amount of worldwide business is done. It makes sense to extend the use of this hardware by adding binary file transfer capabilities. And, as I found while playing with 3D Fax, transmitting large text files can save you lots of dollars. Imagine the savings when 100 pages can be compressed into two, travel in fewer than 4 minutes, and deliver a binary file. 3D Fax offers another important benefit – security. The InfoImage is nothing more than a dense pattern of dots on a page. If you assign a password during compression, they cannot be uncompressed without the right key. Just looking at the dots won’t give any clues on the file type or its contents. InfoImaging offers three 3D Fax configurations: Professional, Standard, and Freeware. The last two versions are limited, so that .EXE, .COM, and .BAT files cannot be processed, and transmissions are limited to only 6KB in the Freeware Edition. The Standard Edition offers more features, though I recommend the Professional Edition which offers the greatest flexibility. For example, to save time during transmission I was able to adjust a sliding bar to sacrifice some of the quality of the graphics image. Or, if the image quality is key, then you can sacrifice speed. 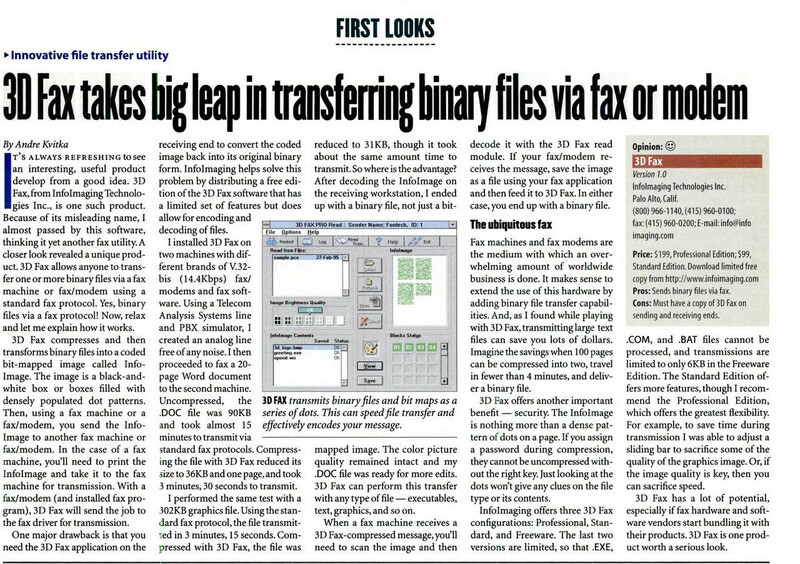 3D Fax has a lot of potential, especially if fax hardware and software vendors start bundling it with their products. 3D Fax is one product worth a serious look.